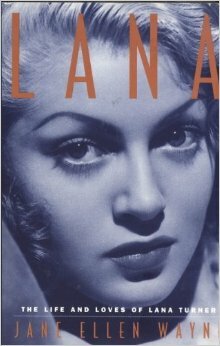 Published by St. Martin’s Press in 1995, Lana: The Life and Loves of Lana Turner by Jane Ellen Wayne promises to tell the “colorful” story of Lana’s life on and off of the silver screen. It’s as much a story of the men in Lana’s life as it is a story about Lana herself. The stories of Lana’s life and career are told side by side, so the reader gets a clear sense of what was happening in her personal life as she was working on certain projects. In many cases, it seems like Lana’s life was even more dramatic than her art. As the book details, she went through many trying times. Information about Lana’s “saucy” romantic life is included; Wayne goes into detail about her relationships with all seven of her husbands. In my opinion, the book tries a bit too hard to go for the scandalous angle… while also leaving out any particularly salacious details. It’s unsure whether it wants to be respectful and discreet or gossipy. Not including the index or filmography that appear at the end, the “meat” of the book fills just under 200 pages, which isn’t long at all considering the fact that it covers Lana’s entire career and so many decades of her life. With such a short page length, a lot of detail must certainly have been glossed over. While Lana: The Life and Loves of Lana Turner is an entertaining read, there’s not a lot of in-depth analysis done. I rated the book 3/5 on Goodreads for its entertainment value and the fact that it was a quick read, but I would rate it lower in hindsight due to the level of detail.